Advertisers Press began in Madison, Wisconsin in 1948 as a small neighborhood printer. Founder, Sam Nuzzo, had just returned from World War II, where he served in the U.S. Air Force. He attended the University of Wisconsin under the G.I. bill and graduated with a degree in journalism. Upon graduation he decided to start his own business in downtown Madison. At its beginning, the company included just three employees. The bulk of the work consisted of letterhead, envelopes, business cards and flyers for neighborhood businesses. Within the first few years of conception, there was a clear vision developing for Advertisers Press. Family, loyalty, and trust proved to be critical for the success and future success of the business. By the late 1960’s and early 1970’s, a number of Ad Press’s current management staff had joined the company at entry-level positions. 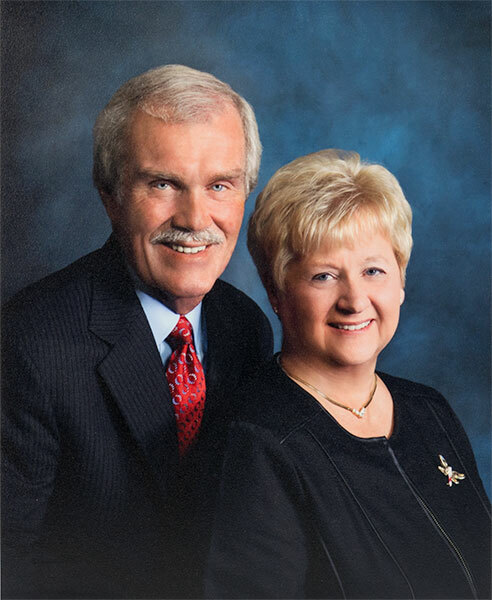 Among those employees were Linda and Bill Wild, who have owned the company since 1997. Since that time, they have maintained Sam’s original ideas and themes of work ethic while continuing to grow. This principle, along with dedication, teamwork, and faith has led Advertisers Press to where it is today. Ad Press began as a small, three-person letter shop and has grown into a $26 million operation that services companies around the country. We are among the Top 15 Woman-Owned businesses in Wisconsin today. Currently, the products and services that Advertisers Press provides for its customers range from business forms, commercial printing, high-volume cut sheets, roll stock, booklet printing, digital printing, fulfillment, warehousing, and more. There are two locations to house the many different operations we have to offer. From beginning to end, the possibilities of what Ad Press can do for its customers are limitless. Advertisers Press was founded upon midwestern family values. We strive to inspire customer loyalty through building lasting relationships, keeping promises made, and being an integral part of our customer’s team. Our commitment to providing the highest quality print solutions, excellent customer service, and attention to detail is shared by employees at every level of our company. 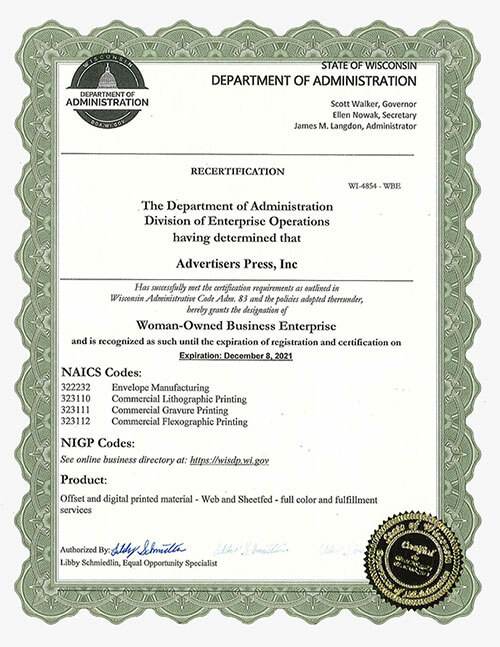 Advertisers Press is proud to be a State of Wisconsin certified Woman Business Enterprise (WBE). WBE certification requires that the business is, at a minimum, 51% owned, managed and controlled by a woman or women. The State of Wisconsin Department of Administration conducts a thorough evaluation process for business applicants seeking certification to ensure requirements are met. The process includes interviews with company personnel, an on-site visit, and an in-depth review of company financials, legal documents, and other factors. In September of 2008 Ad Press received its certification as a FSC® certified printer. This process was undertaken to extend to our clients the option of joining us in a Green Initiative and reduce the impact that our industry has on the environment. Please contact one of our sales representatives to explore your Going Green options through the FSC® program. At Advertisers Press our goal is to offer the highest quality products while leaving the smallest carbon footprint possible. We understand our responsibility is to preserve our environment for future generations. In working towards that goal, we have integrated several conservation programs into our workflow processes along with several energy-saving improvements to our workplace. Ad Press recycles all aluminum plates, fountain solutions, cleaning solvents, and plastic packaging material. All of our computer systems are Energy Star approved. We have designed reusable packaging systems for our large-volume, business-forms clients which helps reduce the amount of corrugated packing material entering the landfill. There is an extensive waste recycling program in our office areas and on our production floor. 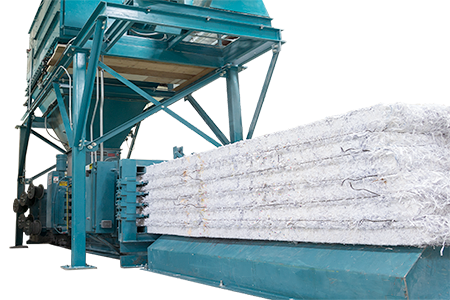 All waste trim is baled and returned to the paper mills for recycling. All plastic roll wrap is also recycled. Ad Press took a portion of the money raised during their annual Holiday Silent Auction to honor a troop stationed in Camp Buehring, Kuwait. We purchased snacks, movies, and other comforting items to send to the 248th Aviation Support Battalion Unit out of West Bend WI. Cory Courtier, a member of this troop and husband of Ad Press employee Dawn Courtier, provided Ad Press with a list of items and helped with the distribution to the troop once the boxes arrived in Kuwait. 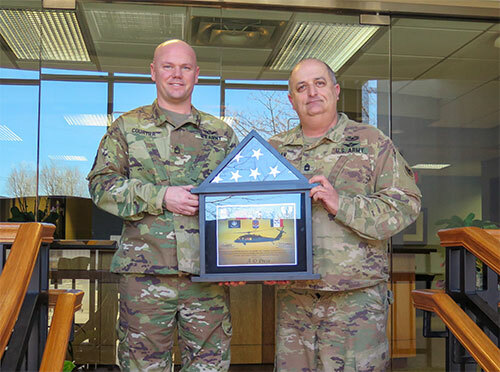 Recently, Cory and Mike Morgan from the Unit presented Ad Press with an American flag that was flown over their base camp as a ‘thank you’ for the generous Ad Press donation of items. It was great to have them visit and present the plaque to Ad Press. We all Thank You for your service. Ad Press celebrated Fat Tuesday 2019 with a baked potato bar and employee-provided sweet treats. Everyone was encouraged to bring in whatever treats they wished to share in honor of the holiday and they did not disappoint. Brownies, cookies, and even a traditional King Cake were the perfect dessert (or an appetizer); to accompany the baked potato spread. Advertisers Press Inc. (Ad Press) has been donating boxes to the Rotary International Book Project since 2008. As of December 31, 2018, Ad Press has donated 10,174 boxes so the Rotary can pack up the books and ship them out to Afghanistan, Pakistan and African countries. To put things in perspective on how many boxes that really is, 10,174 boxes could fill 10 semi-trailers. Wow! Many thanks go out to Bill as he likes to bring in fresh bread on occasion as a “Thank You” to Ad Press and the employees for the box donation. We would like to give a BIG shout out to Ad Press employee Rick Nodolf who continues to work with Bill on this wonderful cause. We feel so fortunate to have teamed up with Bill. Thank you. UW Children's Hospital with Areas of Greatest Need and the UW Kids Cancer Fund. Lake Melvin Yacht Club supports families in need in the Lodi, Dane, and Waunakee areas. Reach Out Lodi fills an immediate need of food, personal essentials, clothing and school supplies to those who are experiencing difficulty purchasing these items on their own. Middleton Outreach (MOM) hunger and prevent homelessness for neighbors in West Madison, Middleton, and Cross Plains through progressive food programs, case management, and housing assistance. MOM hosts one of the largest food pantries in Dane County. Nearly half of those served through MOM are children. 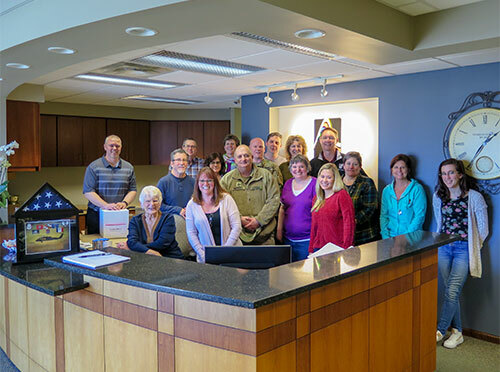 Waunakee Neighborhood Connection is improving the lives of our neighbors by strengthening and engaging the whole community through compassion, purpose, and sharing of resources. From UW Children's Hospital, Thank you for your gift and for making a difference. Through your contribution to the University of Wisconsin Madison: students can earn degrees and become future leaders, innovative research can produce breakthrough discoveries, and the Wisconsin Experience can continue to thrive. From Lake Melvin Yacht Club, Can't tell you enough how much it meant for Lake Melvin Yacht Club to receive your wonderful gift. This will help many families not only at X-mas time but also throughout the year. From MOM, Thank you for your donation. Your compassion and generosity will help families in our community remain in stable housing, enjoy healthy food and send their children off to school in warm clothing on a cold winter morning. Your support makes it possible for MOM to be there for families when a job loss means the pantry is empty, and there is no money left for rent, or when a health care crisis threatens. Thank you for choosing to share generously with those in our community who must cope with the challenges of poverty and hunger every day. You are making a difference in the lives of children and providing hope for them and their families. From Waunakee Neighborhood Connection,Your donation makes a direct impact in our community - allowing WNC to serve out area neighbors with essential needs-based programs and services. Thank you for that funding.